I have a hard time with choosing favorites, at least ones that I can state consistently. What I can confidently say is that I tell my son frequently that HE is my favorite-favorite. Yes, he and my wife Amy are my most favorites of all in my life. That’s an easy answer, perhaps a cop-out, but in this case, they’re people and not things. When it comes to favorite foods, colors, places, or things, I struggle since I appreciate variety and diversity. So let’s explore the things I really like and things that, as an architect, make my life just a little better and in some cases spoiled. What makes these things or places great is that they can be shared. Experiences are best when shared. 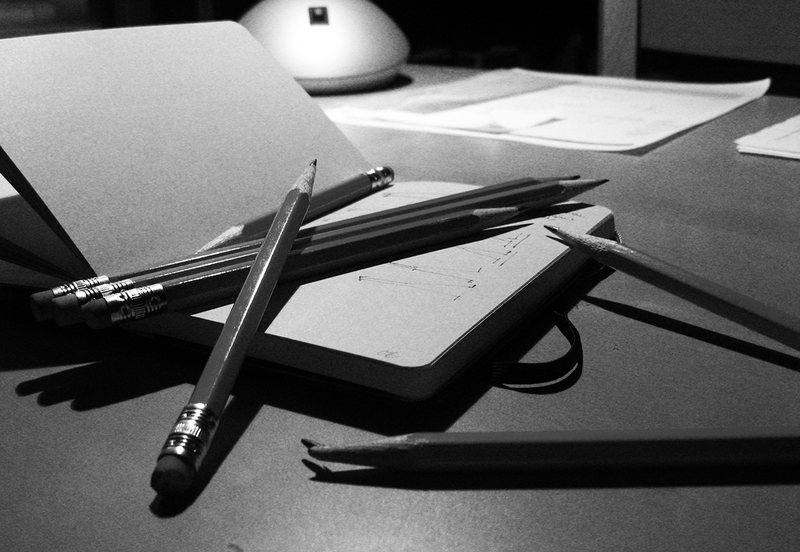 Moleskine sketchbooks and wood pencils – An occasional black pen and a fat lead holder works too. Simple architecture – In our world of “who can make the most outrageous building,” I just appreciate something that works and is beautiful. If the reason it’s beautiful has to do with how it works, then there’s little better than that. Trendy coffee shops – I really enjoy my local coffee shop (White Rabbit Café) and I enjoy visiting other ones, especially ones that are independently owned. Sharing this with someone else is just the best. Unique eateries – My wife and I really enjoy finding a special restaurant that has great food, atmosphere and people. This is where food, graphics and architecture come together to form the brand and identity. “Main Street” architecture – I find it very enjoyable to travel and visit (smaller) cities that have trendy neighborhoods with turn of the century (20th that is) buildings that have been maintained, restored and cared for by local business owners. Cadbury Flakes – Perhaps this is an acquired taste, but this British candy is some of the best chocolate you can get. Unfortunately it’s hard to get in the States. My Mum was English and she introduced us to this British favorite. It’s a simple, but unusual treat. Pittsburgh Steelers and Pirates – Need I explain this one #SteelerNation, Go Bucs. Minor league baseball – It’s all about the game and not about any one player. The stadiums and cities are small and manageable. It also relates back to many other items on this list. Traveling with my family – Based on what I’ve shared so far, I can only truly relax when I get away from home, out of town and out of state. We have an unusual way to vacationing, but we find fun and relaxing things to do. Architecture plays into our trips but not as much as when both spouses are architects. Diners – They’re part of my past – the more stainless steel the better. Eating outside (al fresco) – What’s better than combining travel, unique eateries, good food, warm weather and family or friends? Meatball sandwiches – I’m half Italian and the best sandwich is a meatball sandwich. I can’t say I eat them often, but I was taught to cook Italian by my grandmother. Meatballs and sauce are essential foods to know how to make if you’re Italian. Early CCM music (70’s –90’s) – I was introduced to Christian music in college. It reminds me of so many good and meaningful memories. These artists built the foundation. 80’s music (high school) – I graduated high school in 1985. This music reminds me of those formative and carefree days. 70’s music (childhood) – This music reminds me of being a young kid when it was just my Mum, sister and me. We used to listen on transistor radios. Architectural details – For as much as I love to design the big picture and develop the grand scheme, I’ve always enjoyed the details. To me this is where a structure or space succeeds or fails. Architects get oversensitive about seeing these aspects built well because we know how much time we put into thinking about them, working them out and drawing them. This is architecture at a human scale – the way we can relate to it. They’re very important. I’ll take great details and simple architecture any day over much of what is done today. Food, music, architecture, experience – I guess that’s it. Thank you for reading this and sharing my world today. Architecture is one of my favorite things – sharing it with others is even better. Good question. It has something to do with design I’m sure. Food design, building design, graphic design. I too listened to a fair amount of CCM back in the day (through junior high). But it was not until i was in high school that my musical taste really started to take shape. Most of my favorites come of out of this late 80’s / early 90’s era. Though they are tied to the world of CCM, they do not really fit well into that categorization. Love it Lee! Great to know the “inner Lee” a little better.